THE CHEVRONS WERE Noland's second substantial series after the centered pictures. Prior too their advent, Noland had experimented with a number of symmetrical formats. Usually the symmetrical "Chevrons" (1962-63) consisted of a sequence of evenly spaced "V"-shaped bands descending from the top of a squarish rectangular picture. These were sometimes separated by bare canvas, but were more often contiguous. The point of the lowest chevron often touched, but sometimes hovered above or descended below the bottom of the picture. In the most typical chevrons the bottom edge of the motif intersected the upper corners of the picture rectangle making it interact dynamically with the picture shape. The "Chevrons" replaced the quadrilateral symmetry of the centered images with bilateral symmetry, in effect by making the implied center of the chevron image coincide with the center of the top edge of the painting. With this format, the inverse of the stable pyramid of High Renaissance painting pictures gained enormously in directional energy. This powerful sense of direction implicit in the chevron image gave a new and more measured order to color, creating its own patterns and repetitions. Color clustered into families or stepped across large sections of the spectrum, raising expectations but satisfying with the unexpected. 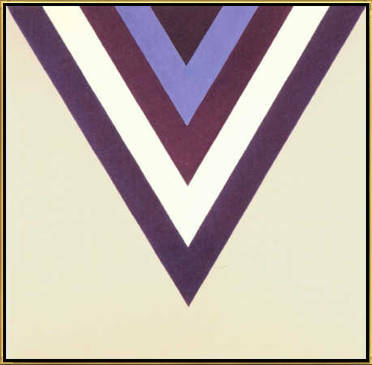 The "Asymmetrical Chevrons", which followed in 1964, seized upon the tendency of the chevron motif to align its lower edge with the upper corners of the picture rectangle. Shifting the point of the chevron off center wrenched the picture away from symmetry and stability, giving an unstable unity. In a sense the "Asymmetrical Chevrons" were inevitable, but their asymmetry brought problems. Because the asymmetrical motif was inherently unstable, what they gained in drama threatened to overwhelm color expression. Although this presented dangers, it suggested a new interaction between picture shape and layout soon to be taken up by the "Diamonds" and more radically still by the '70s "Shapes." Since that time Noland's formats have ebbed and flowed between classical symmetry and various kinds of asymmetry.